I saw a promo for an upcoming run of classic movies on SABC3. 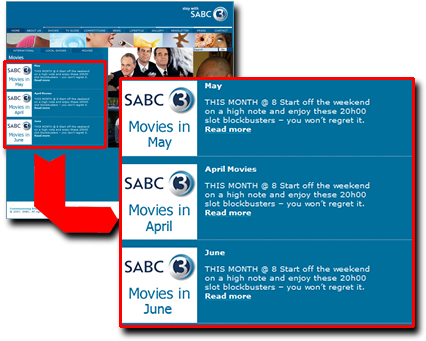 Some of them are ones that I don’t own and would love to see again so I went to the SABC3 web site to look them up. Imagine my surprise when I found that their movie page contained links to subsections for movies in April, May and June. Today is 21 June, so why on earth would I want to know what their movies for April and May were? I either watched or missed them but that is no longer relevant. There is no mention of the classic movies, which are presumably coming up in July, but perhaps we don’t need to know about those. You would think that with all the organisation it takes to draw up schedules, and advertise them; that they would also keep on top of updating their web site. This entry was posted in Thoughts and tagged Internet, sabc, sabc3, Television, tv, Web. Bookmark the permalink.